Jaromir Jagr has likely played his last NHL game. But the future Hall of Famer entertained hockey fans across 24 seasons, playing an incredible 1,733 games. 1. Jagr has been teammates with 13 Hockey Hall of Famers: Mark Reechi, Paul Coffey, Mario Lemieux, Bryan Trottier, Larry Murphy, Ron Francis, Joe Mullen, Adam Oates, Mark Messier, Brian Leetch, Eric Lindros, Brendan Shanahan and Chris Pronger. 2. That list doesn't include former Jagr teammates Martin Brodeur, Roberto Luongo and Henrik Lundqvist, who are all likely future Hall of Famers who rank in the top 10 all-time in wins. 3. Jagr has reportedly been doing 1,000 squats per day since he was 7 years old. That means he has done nearly 14 million squats. 4. Jagr's oldest teammate was Bryan Trottier (born July 17, 1956), whom he played with on the Pittsburgh Penguins. His youngest was Matthew Tkachuk (Dec. 11, 1997) with the Calgary Flames. The age difference between those two players is 41 years, four months and 24 days. 5. In his first season with the HC Kladno under-18 team, Jagr finished second on the team with 41 points in 34 games. He was 12 years old when that season started. 6. Jagr moved up to the under-20 Czech league two seasons later. In just 30 games (the season was 40 games long), Jagr led the league with 70 points. 7. According to the Elias Sports Bureau, Jagr has played in 62 different venues during his NHL career. 8. Jagr was the only active player during the 2017-18 season to play in the Boston Garden (six goals and 10 points in nine games) or the Montreal Forum (six goals and seven points in 11 games). 9. Jagr played for 22 different head coaches in his NHL career. 10. Eight of Jagr's head coaches are in the Hockey Hall of Fame: Bob Johnson, Scotty Bowman, Craig Patrick, Herb Brooks, Glen Sather, Lou Lamoriello, Adam Oates and Scott Stevens (Lamoriello, Oates and Stevens were all co-head coaches during the second half of Jagr's 2014-15 season with the New Jersey Devils). 11. Jagr was drafted in 1990 and was the final player left from that class. No players from the 1991, 1992, 1993, 1994 or 1995 NHL draft classes have played in a game this season. 12. In fact, no active player in the four major North American pro sport leagues was drafted before 1994. 13. Jagr was drafted two months after Emmitt Smith was picked by the Dallas Cowboys. Smith retired as the NFL's all-time rushing leader 13 years ago. 14. Jagr was drafted fifth overall, 14 spots ahead of Keith Tkachuk. Jagr was recently teammates with Keith's son, Matthew Tkachuk. 15. Among players picked fifth overall in the NHL draft, Jagr has over 1,000 more points than any of them. Hall of Famer Scott Stevens ranks second with 908 points (Jagr has 1,921). 16. When Jagr made his NHL debut, a 13-year-old Tom Brady had not yet started high school. 17. "The Simpsons" have aired 616 episodes since Jagr made his NHL debut, which came six days before the show's second season premiere. 18. 3,152 players have scored an NHL goal since Jagr made his debut. 19. 170,348 goals have been scored in the NHL since Jagr's debut. 20. When Jagr made his NHL debut, MLB home run king Barry Bonds had 117 career home runs. 21. The NHL had just 21 teams when Jagr made his NHL debut. The league had one team in California and none in Florida, Texas, Nevada, Arizona, Ohio, North Carolina or Tennessee. The Quebec Nordiques, Hartford Whalers, Minnesota North Stars and Winnipeg Jets (version 1.0) were active. 22. UConn women's basketball coach Geno Auriemma had just 92 wins when Jagr made his debut. Auriemma crossed the 1,000-win mark this season. 23. Since Jagr made his NHL debut, 36 countries have joined the United Nations, including the Czech Republic. 24. Jagr has represented the Czech Republic at the Olympics five times. Finland's Raimo Helminen is the only men's hockey player to participate in more Olympics. 25. Before Jagr's NHL debut, just 24 players from what is now called the Czech Republic had played in an NHL game in league history. This season alone, 31 players from the country have played in an NHL game. 26. Jagr is one of two Czech players, along with Jiri Slegr, in hockey's "Triple Gold Club" as he won Stanley Cups in 1991 and 1992, an Olympic gold medal in 1998 and the World Championships in 2005 and 2010. 27. In the first year of NHL participation at the Olympics, Jagr tied for the team high with five points in leading the Czech Republic to the gold medal. This happened 20 years ago. 28. Jagr won his first Stanley Cup on May 25, 1991. That's more than two weeks before Michael Jordan won his first NBA title. Since then, Jordan won five more championships and retired three times -- the last of which was 14 years ago. 29. Jagr won a Stanley Cup three months before Pearl Jam released their debut album "Ten." Pearl Jam is now in the Rock and Roll Hall of Fame. 30. Jagr scored his first career hat trick on Feb. 2, 1991 (against the Boston Bruins), a week before Adam Sandler made his debut on "Saturday Night Live." 31. Jagr won two Stanley Cups before the original "Jurassic Park" movie was released in theaters. 32. Jagr had 24 points in the 1992 Stanley Cup Playoffs as a 20-year-old. He's the youngest player in NHL history to record 20 points in a single postseason. 33. Jagr was in EA Sports' "NHLPA '93," the first video game to feature NHLPA-licensed rosters. He was rated an 82 overall in the game, five points better than Wayne Gretzky. 34. Jagr scored 16 goals against the Whalers, 11 against the Nordiques and three against the North Stars. No other active player in 2017-18 scored on any of those teams. 35. Jagr represented the Wales Conference All-Star team on two occasions. No active player has played in the Wales Conference. 36. Jagr finished the 1995-96 season with 149 points, the most in a season in NHL history by a player born outside of Canada. 37. Jagr played in the first North America vs. the World All-Star Game in 1998. That game featured 24 players already in the Hockey Hall of Fame. 38. Jagr's career pre-dates the NHL keeping track of time on ice. 39. If you extrapolate Jagr's average ice time over his first eight seasons, he has had more than 24 days of NHL ice time in his career. 40. Jagr won the Hart Trophy in 1999, his ninth NHL season. That was nearly a year before the first episode of "Survivor." The reality show is about to start its 36th season. 41. Jagr has finished second in Hart Trophy voting on four occasions, tied with Jean Beliveau for the most such finishes in NHL history. 42. In the 1999-2000 season, Jagr finished one point behind Chris Pronger in Hart Trophy voting -- the closest vote in the trophy's history. 43. Jagr is one of four players to win four consecutive Art Ross Trophies. The others: Wayne Gretzky, Phil Esposito and Gordie Howe. 44. Since Jagr won four straight Art Ross Trophies, no player has won the award in consecutive seasons. 45. In the past 20 seasons, Jagr had three 120-point seasons. The rest of the NHL has combined for two such seasons during that stretch. 46. Jagr has 11 career shorthanded goals. But he has not scored one since his 2002-03 season with the Capitals... 5,550 days ago. 47. 216 different players have an assist on one of Jagr's goals in the NHL. 48. Two Hockey Hall of Famers have exactly one assist on Jagr goals: Mark Messier and Eric Lindros. 49. Ron Francis assisted on 110 of Jagr's goals, more than any other player. Francis has been in the Hockey Hall of Fame for 10 years. 50. Jagr has 135 career game-winning goals, more than any other player in NHL history. 51. Jagr has 15 career 30-goal seasons, the second most in NHL history behind Mike Gartner. Wayne Gretzky only had 14 such seasons. 52. Excluding the expansion Vegas Golden Knights, Jagr has scored at least seven goals against every active NHL franchise. 53. Jagr has scored the first goal of a game 135 times in his career, the most such goals in NHL history. 54. Jagr has worn No. 68 every game during his NHL career. Fourteen other skaters have worn that number in an NHL game and have combined for 563 goals -- 203 fewer than Jagr. 55. The oldest active player in the NBA is Vince Carter (41 years old). Jagr already had 322 goals and 807 points in his NHL career when Carter made his NBA debut. 56. Jagr played 155 games in the KHL. If those would have been NHL games, he would have broken the NHL games-played record two days before his 44th birthday, during the 2015-16 season. 57. Eleven of Jagr's teammates with the Flames during the 2017-18 season were born after he made his NHL debut. 58. If Jagr were coaching instead of playing, he'd be the fifth-youngest head coach in the NHL. Mike Yeo (Blues), John Hynes (Devils), Jeff Blashill (Red Wings) and Jared Bednar (Avalanche) are all younger than Jagr. 59. Jagr was on the ice for 2,499 of his team's goals during his career, 10th-most in NHL history. The rest of the top 30 are in the Hockey Hall of Fame. 60. Jagr has 16 career hat tricks, including the postseason. His first and last hat tricks occurred nearly 24 years apart. 61. Jagr has scored 61 career goals against the Islanders, 14 more than he scored against any other team (the Flyers are second). 62. Jagr has scored a goal in 623 different regular-season games. That's 21 more than Wayne Gretzky. 63. Jagr has never had a fighting major in his NHL career. He has had three major penalties in his career (two for high sticking and one for checking from behind). 64. Jagr has 201 career playoff points. He is one of five players to reach 200 playoff points, and the only one who wasn't a member of the Edmonton Oilers' dynasty in the 1980s. 65. 1,292 names have been engraved on the Stanley Cup since Jagr made his NHL debut, including the two times that Jagr's name has been added. 66. 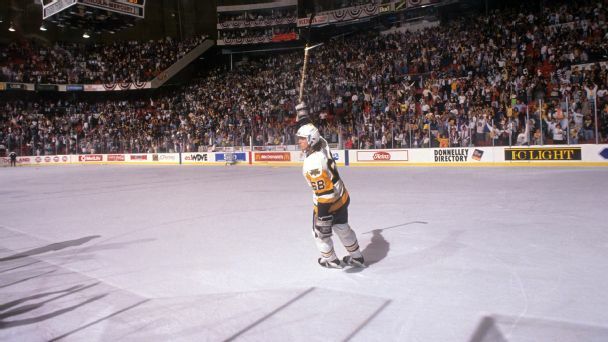 Mario Lemieux assisted on 35 of Jagr's power-play goals, more than any other player. 67. Jagr finished seventh in Hart Trophy voting in 2016 when he was 44 years old, becoming the oldest player to finish in the top 10 for the MVP award. 68. Only two other skaters have played in an NHL game after turning 45: Hall of Famers Gordie Howe and Chris Chelios.